Every single person I’ve spoken to about this year's Spring anime season has put Boku no Hero Academia ( My hero academy ) somewhere on their hype list ,myself included. We open on a very strong OP, with an insanely catchy tune playing alongside some gorgeous visuals, the bold and striking block colours of the show’s title are very reminiscent of early superhero shows and comic books. In a few short minutes we’re introduced to our main character, his rival and his mentor alongside the supporting cast not in the most original way perhaps but there is a lot of focus on the main trio’s personalities and I was impressed how much we were told about them without any words. The action sequences are flashy and serve to show off more supporting cast and villains. The transitioning and constant flow serves to create a sense of excitement and an urge for action. The stylized art-style is beautiful and the character designs and costumes are original and inventive, each character stands out and is unmistakable. The animation on the whole is great and the fight scenes are flashy and bombastic with a plethora of special moves and quirks displayed just in the first 10 minutes every blow landed feels powerful and weighted. 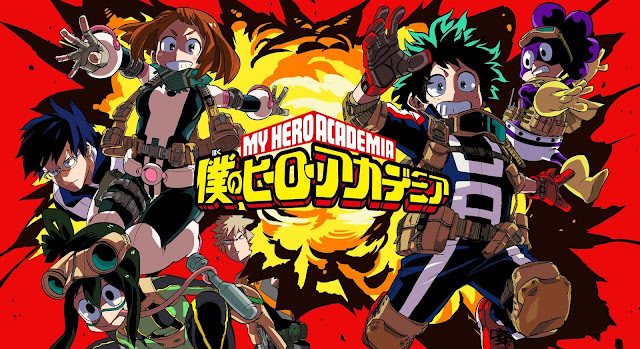 Every quirk ( the shows take on superpowers ) are all inventive and slickly animated , cleverly fitted around every character's personalities. Our MC is not only very likeable but an interesting spin on the shonen trope where the MC is the most talented in the world. His lack of super-powers makes him relatable to the audience who also (I assume) don’t have super-powers and thus share his feelings. He’s also a super-hero nerd again a trait most viewers will be able to sympathize with and so we want to see him grow and be successful. Other characters are personified with small touches in their animation for example in the classroom shot , you can see Izuka writing his own note furiously while Katuski is slouched nonchalantly displaying confidence and a feeling that he’s above this triviality. Our story and main characters conflict is established quickly , he’s in the 20 % of the population born without powers who wishes to become a hero , he has a history and a ( quite one-sided ) rivalry with the top student in his class. Rather simple but it allows for a lot of drama and growth and one of the greatest parts of a good shonen is watching a well-liked character get stronger and develop.